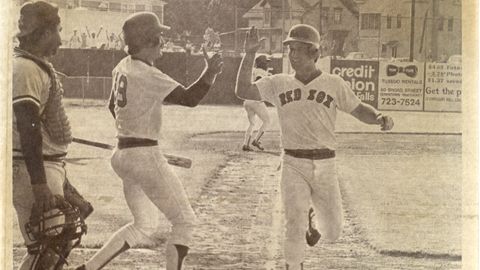 Future Hall of Famer Wade Boggs congratulates Marty Barrett as he scores the winning run. This week marked the 30th anniversary of one the most absurd, unique and highly celebrated Minor League moments of all time -- professional baseball's one and only 33rd inning. It occurred at Pawtucket's McCoy Field on June 23, 1981, in the resumption of a contest between the hometown PawSox and visiting Rochester Red Wings that had begun two months earlier. The first 32 innings had been played on April 18 and 19 as a frigid and windy Saturday night transformed into an equally bone-chilling Easter Sunday morning. The game was finally suspended at 4:07 a.m. with the score tied at 2-2 after 32 frames, giving the exhausted participants an all-too-brief reprieve before the following afternoon's matinee. But, though the first 32 innings took place amidst horrendous conditions before a crowd that eventually dwindled to 19 preternaturally hardy souls, the 33rd was something else entirely. With Major League Baseball in the midst of a debilitating players strike, a sellout crowd and massive media contingent jammed into McCoy Stadium to watch the much-hyped conclusion of the longest professional baseball game of all time. The so-called Longest Game has been copiously celebrated over the past three decades, from a constant stream of McCoy Stadium commemorative cups to player reunions to innumerable articles exploring nearly every conceivable angle (particularly the presence of a pair of future Hall of Famers: Rochester's Cal Ripken and Pawtucket's Wade Boggs). Montgomery's Matt Moore threw a nine-inning no-hitter on Thursday vs. the BayBears. MVPs were crowned in the FSL, CAL-CAR, SAL and MWL All-Star Games; Scott Van Slyke took SL honors. Second baseman Adam Heether started the RockHounds' second triple play in the last month on Monday. Phil Hughes will lead EL Eastern second-place Trenton vs. first-place New Hampshire on Friday, June 24. Matt Harvey will make his Double-A debut on Sunday, June 26, when Binghamton pays a visit to Bowie. The Brewers' Miller Park will host the MWL matchup between Wisconsin and Peoria on Wednesday. But Dan Barry's new book Bottom of the 33rd: Hope, Redemption, and Baseball's Longest Game towers over everything that has come before, offering a truly definitive account of perhaps the most famous game in Minor League Baseball history. Barry, a Pulitzer Prize-winning New York Times journalist, approaches the game at both a micro and macro level, alternating oft-absurd accounts of the action of the field with detailed and highly sympathetic portraits of the individuals involved. Throughout, he tries to answer the simple but profound question of "Why?" "Someone not here tonight could pose quite legitimate questions to players and fans, questions that would naturally start with why," he writes in the book's prologue. "Why did you keep playing? Why did you stay?" "Because we are bound by duty. Because we aspire to greater things. Because we are loyal. Because, in our own secular way, we are celebrating communion, resurrection and possibility." Barry, who used to live in Pawtucket, got the idea to write Bottom of the 33rd after coming across a friend's copy of Steven Krasner's children's book The Longest Game. "Reading it, I had an epiphany, asking myself 'What would it be like to be the center fielder going out for the 33rd inning?' I saw so much possibility," recalled Barry. "Guys like Dave Koza or Sam Bowen or Dallas Williams, when they step to the plate you can freeze-frame that moment. Who is Dallas Williams? Where did he come from? What happened to him? He'll be remembered forever as the guy who went 0-for-13, but look at that this way: He came from the New York City projects, from a gospel-singing family, he was the best player in the city and a No. 1 Draft pick. ... You can't summarize a man based on one game, or one season. There was so much more richness to be explored." These in-depth character profiles and philosophical musings alternate with the inherently comic retelling of the action in and around the stadium, in which players are burning discarded bats to keep warm while colorful owner Ben Mondor shares his personal supply of Chivas Regal with stalwart grandstand denizens. "I wrote with great affection," said Barry. "I didn't want to be seen as a guy parachuting in from New York to make fun of a place, I wanted to take the time to understand." Massachusetts native "Walpole" Joe Morgan managed the PawSox in 1981, the eighth of his nine seasons at the helm. The distinguished skipper, who went on to manage Boston to two division titles and still lives in Walpole, offered a concise but admiring summation of Barry's work: "He told the story the way it was." Morgan's memories of the ballpark conditions are, not surprisingly, less than flattering. "It was a brutal night and the wind was howling," recalled Morgan. "It was always cool at McCoy, especially because it was near the Narragansett Bay and that made the wind blowing in 10 times worse. It was almost like during the game, the players knew that no one was going to be able to score. It was just a helpless feeling." "Morgan sneaks off to a favored hiding spot behind the backstop and under section 9, a corner of the McCoy underbelly where wood is stacked and rubble thrown and equipment stored. He knows that back here, if you pull a little on the forest green plywood fastened by wire to the chain link fence, you can create a secret portal to the grass-and-clay spectacle of a baseball game." "But I didn't spy out there for long -- the wind was blowing too hard, so I put that to rest after a short while," said Morgan. "In my office, I could hear the other team coming [into the clubhouse], saying the same thing that our guys were saying: 'I don't care who, but somebody's got to score.'" But, of course, no one did. Morgan's counterpart that evening was Doc Edwards, who watched Morgan's ejection with no small amount of envy. "I always knew Joe was smart, but I didn't know he was that smart," said Edwards, an indomitable baseball lifer now managing the independent San Angelo Colts in this, his 54th pro season. "The locker room was warm." Edward's overriding recollection of that long night's journey into day was that "Mother Nature won that battle before we got to fight it," a reality that led him to take risks he otherwise wouldn't have. When Tom Eaton lined a two-out base hit to right field in the top of the 32nd, Edwards made the risky decision to wave John Hale home from second base. "As Hale rounded third, I could see that he was probably going to be out by 30 feet but I sent him anyway," said Edwards. "It was wet out there, and I was hoping that the ball would slip out of [right fielder Sam Bowen's] hands and go into the stands." But it was not to be. Bowen's throw was true and Hale was indeed out by 30 feet. After the Paw Sox failed to score in the bottom of the 32nd, the game was finally suspended. The Paw Sox were a lean operation in 1981, with beloved owner Ben Mondor (who passed away this past fall) primarily assisted by young general manager Mike Tamburro and even younger PR man Lou Schwechheimer. Both men are still with the team today (the former serving as president and the latter as vice president and general manager), and on Tuesday they took the time to speak about the game. "That game turned out to be the turning point of our franchise, although we didn't know it at the time," said Tamburro. "It not only put us on the map in the baseball world, but it made locals realize that something important was happening in that little ballpark on Division Street." "What's ironic, looking back on it, is that Mike spent the better part of the evening trying to get the game stopped!" added Schwechheimer. Indeed, he did. The International League constitution stipulated that no inning should start after 12:50 a.m., but this crucial specification was somehow omitted from that year's copy of International League Instructions for Managers, Umpires and Players. Head umpire Jack Lietz, whom Barry describes as "a literalist of the first order," therefore decreed that the game must continue. "At 10 past one I took the league constitution out to Jack Lietz and showed him [the curfew rule]. Jack just looked at me and said 'Mike, that doesn't mean s--t to me!'" recalled Tamburro, still laughing at the memory. And Lietz would have forced the game to continue beyond the 32nd, had fate not intervened. After trying for hours, Tamburro finally got a hold of league president Harold Cooper. His purported response was a terse "Call the damn thing after this inning." So blame it on the weather, or bureaucratic omission, or rigid arbiters, or conspicuously absent league presidents, or clutch pitching, or any number of other factors. The fact is that somehow, someway, 32 innings were played in one unfettered, eight-hour chunk. And then came the June 23 sequel, in which the abject misery of the sparsely populated original was replaced by a circus-like atmosphere. The eyes of the sporting world zeroed in on McCoy, with everyone eager to witness a further excursion into already uncharted baseball waters. The team crammed 175 members of the media into a makeshift section built behind home plate, so that they could chronicle the action for readers, listeners and viewers desperate for a memorable baseball fix in the midst of the Major League players' strike. "I remember Ben [Mondor] saying 'The [media section] took $5,000 to build, and now it's gonna take another $5,000 to feed them!' recalled Schwechheimer. Morgan chose Bob Ojeda as the day's "starter," with Schwechheimer remembering that he had "an incredible look of determination on his face. His hand's were on Ben's shoulder and he said 'Boss, I'm not gonna lose this one.'" Edwards, after much deliberation, countered with the seasoned Steve Grilli. "I wanted to keep the pressure off the younger pitchers, so I went with a veteran," he said. "So much for being smart." Indeed, Edwards' best laid plans went awry. Ojeda breezed through the top of the 33rd, but Grilli loaded the bases on a hit batter, single and an intentional walk. That brought up Dave Koza, a Pawtucket veteran whose post-career alcoholism and subsequent redemption serve as one of Bottom of the 33rd's most resonant story lines. Koza, a strapping Wyoming native known for his power, mustered a wobbly floater over a drawn-in infield that brought in future Red Sox hero Marty Barrett with the winning run. Pandemonium, and heartbreak, ensued. "That ball landed on the dirt behind third base, and then rolled into the outfield," recalled a still-rueful Edwards. "And, believe me, I saw every roll of that ball." Edwards' managerial opponent also felt let down, but for different reasons. "I wanted it to go for at least another four or five innings," said Morgan, who officially ceded managerial powers to coach Mike Roarke after his 22nd-inning ejection. "If we got to 40 then no one would ever top it." As Barry makes clear in Bottom of the 33rd, all the game's participants now take immense pride in having taken part in the longest game in professional baseball history. Despite going on to accumulate more than 6,100 Major League hits between them, Ripken and Boggs both provided memories of specific at-bats throughout the contest. And for those who never made it to the Majors, the game provided a personal link to baseball immortality that otherwise would have eluded them. "If you had asked [the players] how they felt at 4:30 a.m. that Easter Sunday I think they would have slugged you. They were cold, tired and pissed off that another game was just a few hours away," said Barry. "But 30 years later, they were all glad that some knucklehead from New York was calling them up. They're glad to be in on it, taking pride in knowing that this is their way of being included in the Hall of Fame." And what got them there was unwitting participation in one of the most simultaneously profound and ridiculous nights in the history of American sports. "It was both sacred and absurd," said Barry. "A night of communion, and a night of insanity."